Mechanics of coagulation/flocculation and solid-liquid separation by membrane processes in drinking water treatment. D.A. Ladner, D.R. Vardon, and M.M. Clark. Effects of shear on microfiltration and ultrafiltration fouling by marine algae. J. Membr. Sci. 356, 33-43 (2010). 45. D.R. Vardon, D.A. Ladner, and M.M. Clark. Laser scanning cytometry for algal monitoring in seawater desalination plant feedwater. Submitted to Water Research. 44. D.A. Ladner, A. Subramani, M. Kumar, S.S. Adhan, and M.M. 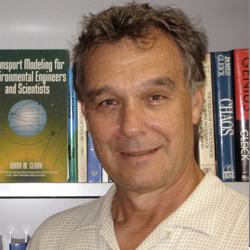 Clark, “Bench-scaleevaluation of seawater desalination by reverse osmosis,” Desalination 250, 490-499 (2010). 43. Ahn, W.-Y., Kalinichev, A.G, and M. M. Clark, “Effects of Background Cations on the Fouling of Polyethersulfone Membranes by Natural Organic Matter: Experimental and Modeling Study,” J. Membrane Science, 309, 128-140 (2008). Kumar, M., Grzelakowski, M., Zilles, J., Clark, M., and W. Meier, “Highly Permeable Polymeric Membranes based on the Incorporation of the Functional Water Channel Protein Aquaporin Z,” Proc. National Academy of Sciences, 104, 52: 20723-20728 (2007). Ladner, D., Lee, B., and Clark, M.M., “Laser Scanning Cytometry for FluorescentMicrosphere Enumeration,” J. American Water Works Association, 99, 3: 110 (2007).